I often find myself getting compliments on “being a supermom”, and I get it! I walk into a room looking like I need an extra arm, leg and foot, yet always have a mile on my face! But “supermom?? Unless you mean a TOTAL MOM (I mean look at me!) I can’t help but laugh at what people might imagine my life would be like. I hope it is far from perfect! If only you guys knew the real world I live in. As I sit here typing this I can see laundry piled on my couch, high chairs that haven’t been cleaned all weekend, toys scattered all about, and thank GOODNESS there is not a mirror in front of me. My mom bun is falling out from yesterday evening and I am still in pajamas. I will take being a “supermom” as a compliment any day! I might even give it the title of “The Greatest Compliment Ever”!! But if you are reading this and feeling like you ARE NOT a supermom. Like you have failed already on this Monday; I want to shed some light on my real life and the real expectations you should hold yourself accountable for as a mom. 1. Change your babies bum! First thing I did that morning was change those soggy stinky bums! If you did that today, you are one heck of a mom! It needed to be done and no one else was going to do it. You did it even if you didn’t want to because you knew you had to. Because you are someone’s provider, protector and MOTHER! That job alone in itself is super! 2. Feed your babies! I nursed my babies this morning, fed them vanilla pudding for breakfast, and then gave them a bottle of formula (or tried) to go to bed. Obviously I can’t judge anyone and wouldn’t claim to be “supermom”! I did what I had to do in order to survive. Sure, the vanilla pudding was a new one, but they loved it and so did I. It was a win-win! Sometimes for meals I will feed them homemade organic baby food I made myself! On days like that, I give myself an extra pat on the back (or cookie and soda because yay healthier choices right?!) Do I feel any WORSE that I fed my babies pudding for breakfast opposed to the mango puree in my freezer? NO! I will not be hard on myself for WHAT I feed my kids and neither should you! My job as their mom, even as a “supermom” is to feed them. That’s it. The breast, a bottle, a pudding cup, or organic baby food. If you fed your child today, no matter what it was… YOU, my dear, are a SUPERMOM! 3. Love your babies! This one is the easiest and sometimes the hardest! It is so easy for me to love a giggling, happy baby. But I can also find myself overwhelmed and consumed by baby cries and needs. It can become hard to comfort, love, and soothe that same sweet angel who now twists and turns and pushes and cries in my arms! It is my job as a mom to check that numbers 1 and 2 are done. Then all I can do is love you! 4. Let your babies love you! For now, I will let them crawl into my lap and play with my hair. I will let them show me new tricks and use me as a stepping stool. I will let them blow raspberries on my arm and claw out my eyes as they examine my face. These are the ways my babies love me! Though, lately I have been getting big sloppy wet kisses and they are my FAVORITE! Someday when they get even bigger, I hope they draw me pictures and want to turn my nap time alone on the couch into a giant cuddle session. I hope they make me breakfast that tastes terrible and homemade cards with glitter left EVERYWHERE to clean. Because those moments are how they show me they care, love, and appreciate me. Let them make those messes and ruin those naps. Try and find the beauty in those moments instead of the burdens. 5. Try (Notice I keep using the word “try” a lot! No one is perfect!) and stay happy all day! I try and always wake up with a smile on face and singing a little song. It makes the mornings feel fresh and new! I have learned as a mom, that kids can ruin great moods and fast! I wanted to be productive this morning and drink coffee. Make us all waffles and write down to-do lists! Sometimes my kids don’t have the same mindset. They wanted to snuggle and nurse on the couch for twenty minutes. Then they fought over toys and I had to intervene. Then they get into EVERYTHING all the time and cry when I tell them no. These times though, are fleeting moments of being overwhelmed like I mentioned before. I refer to number 3 or 4, and stop what I am doing to see what I can do to calm the whole house down and lift all our spirits. Sometimes I break and we all end up being mad at each other for a bit because no one is HAPPY anymore. When the twins aren’t happy, I’m not happy, and NO ONE is going to be happy. So being the problem-solver that I am, I try and come up with solutions. How can I most easily fix the problem and restore happiness back into the home? If you are a mom who tries to keep her entire house happy (an impossible job), then YOU are a supermom! 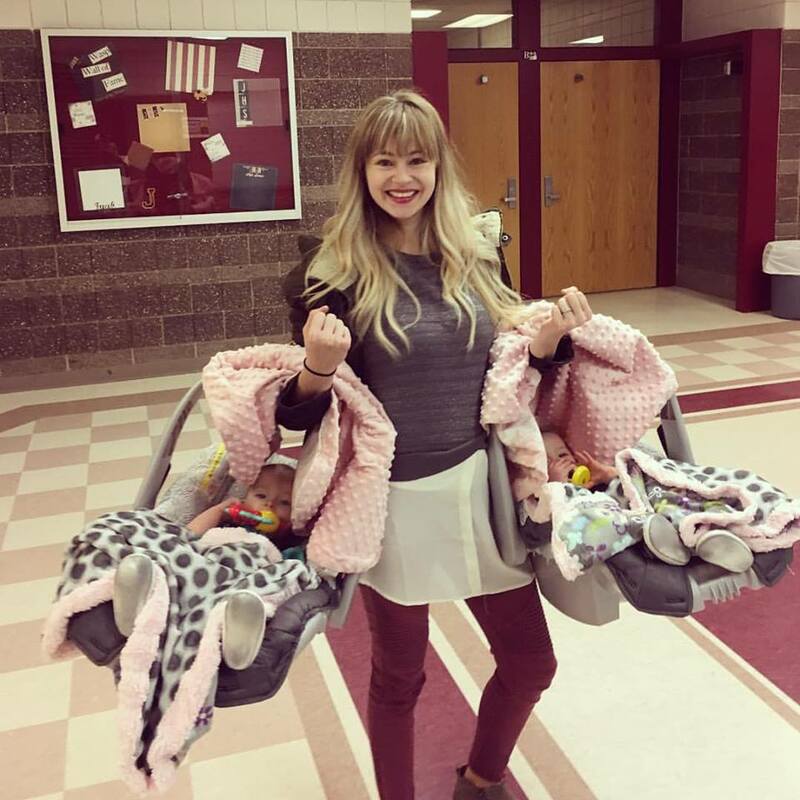 I hope that this has shed some light onto the fact that I am definitely not the poster person for “supermom” but I will be damned if someone says I don’t do my best! Today’s best just happened to be a pudding cup, because it’s Monday, don’t judge me! I hope you enjoyed a refreshing view on motherhood from my eyes, and accepted the fact that we all are indeed SUPERMOMS! We keep the future of America alive all day… What do you do?? The USA to UK: C-Section Edition!